Can I Install Solar Panels on a Metal Roof? If you want to go solar but have a metal roof, you might wonder whether a solar installation is even possible for you. Metal roofs have a lot of benefits and while they make up just a small portion of residential roofs now, they are growing in popularity. If you’re interested in solar, this naturally raises the issue of whether solar panels on metal roof is even possible. When you think about it, metal roofs share many of the same benefits of solar and they are the perfect companions for each other. They are both long-term investments, environmentally friendly, and help you reduce your energy use. Case in point: Metal roofs are composed of a high percentage of recycled materials and can also be recycled at the end of their life, unlike traditional shingles. They also reflect heat from the sun, instead of absorbing it like composition shingles, thereby reducing your cooling bill. Lastly, while they are more expensive upfront than composition shingles, they last 2 to 3 times longer if installed properly, so you save money in the long run. If you’re wondering if you can put solar panels on a metal roof, in short the answer is yes. How easy or difficult it is though depends on the type of metal roof you have. Find your roof below to see how you can safely install solar panels. This is the type of roof you probably think of when you think ‘metal roof’. They don’t look like typical asphalt roof shingles. Instead, they are flat metal panels, with seams running down the roof in regular intervals (like the picture above). There are many different kinds of vertical seam panels and below is just a small sampling of what’s out there and how you can install solar on them. Out of all the metal roofs to install solar on, standing seam is probably the easiest. If you’re interested in installing solar on your standing seam roof, you actually have two choices: conventional crystalline solar panels (the rectangular solar panels you see on roofs) and thin film solar panels. When installing conventional solar panels on asphalt shingles, the solar panels are simply bolted through the shingles to the roof joists, providing a very strong, sturdy attachment. 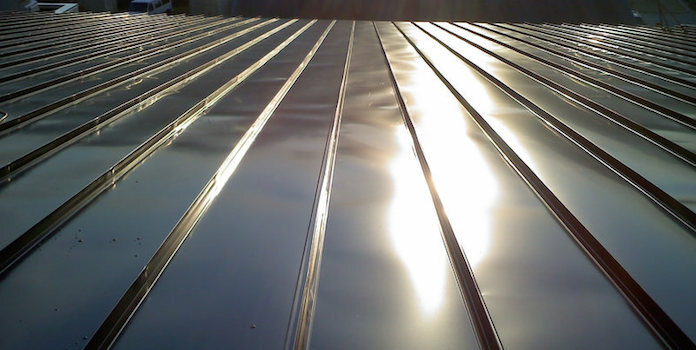 For standing seam roofs, the solar panels simply clamp onto the ‘seam’ where two panels are connected. The clamps don’t actually go through the seam, but squeeze the seam tightly so wind can’t pull the solar panels off. Since there’s little to no drilling through the roof, potential leaking is not an issue like with asphalt shingles. SnapNrack, one of the biggest solar panel hardware manufacturers, produces several different types of attachment hardware for standing seam roofs. 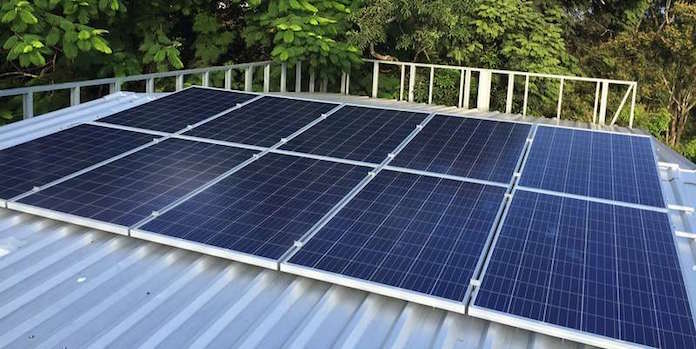 S-5!, a company that manufacturers standing seam attachment hardware for a variety of applications, also produces attachment points for solar panels. If you’re looking for a sleeker option, thin film solar panels attach directly to the roof, between the seams. 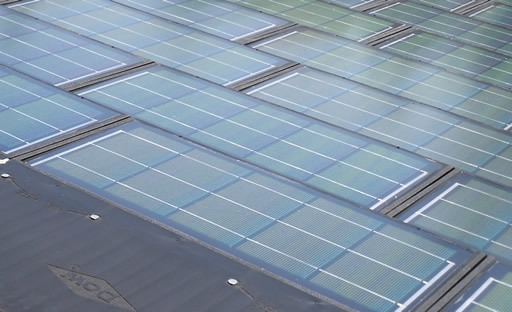 Unlike conventional solar panels, thin film solar on metal roofs lays flat against the roof, in direct contact. This allows your solar installation to look discrete and natural. Uni-Solar is the most well-known manufacturer of thin film solar for standing seam roofs. The solar panels are about 15.5” wide, so Uni-Solar recommends at least 16” between roof seams (p.13). If you’re worried about durability, Uni-Solar claims the solar panels are rated against winds up to 130 MPH (p.16 of the report above). The panels come in 9’ or 17’ lengths, with the shorter panels producing 68 watts and the longer panels producing around 140 watts. There are many types of vertical seam roofs, and solar companies have designed different kinds of attachment hardware for many of these. For example, both SnapNrack and S-F! manufacture attachment points for corrugated metal roofs that do not crush the metal underneath the hardware. If you’ve got another type vertical seam metal roof, chances are someone is making a solar attachment point for it. Be sure to ask your installer what’s out there! You’ve probably seen these metal roofs before, but you would never know it since they are designed to mimic more conventional roofs like asphalt shingles, clay tile, slate, wood shake, and others. These metal roof panels can be painted or have granules glued to the surface to really give it the look of composition shingles. Installing solar on metal roof shingles is more challenging than other metal roofs. Unlike the vertical seam metal roofs above, there’s not a quick fix for metal roof shingles. Installing solar panels requires more labor and tweaking from installers while on the roof to make sure everything is safe and water-tight. In fact, water-tightness is the main issue with metal roof shingles. You can’t simply throw a flashing on and apply a sealant like with conventional roof shingles. With metal shingles, more precautions must be taken, usually meaning doubling or tripling up on flashing and creating water runoff points underneath the metal flashings. That being said, installing solar on metal roof shingles is certainly not impossible and if installers are experienced and knowledgeable, it’s nothing a small crew can’t handle in a few days. Today, we’ll focus on two common metal shingle types: batten mounted and interlocking. Each of these presents serious challenges to installers and QuickMount, a leading solar hardware manufacturer, has developed some unique solutions to these challenges. These are metal shingles that are installed over a wooden lattice framework (known as batten) that is attached to the roof. To install solar on batten mounted metal shingles, you need to sandwich the solar flashing between two layers of metal shingles. The shingles must be removed to attach the mounting hardware to the roof, then the layers of shingles and flashing are installed with holes to allow the attachment point to stick out. Of course, waterproof sealant is used on all joints to ensure there is no leakage. Some metal shingles interlock with the shingles both above and below, creating a roof that is very strong against high winds. Installing solar panels on interlocking metal shingles requires a waterproof membrane (which QuickMount calls an underpan) placed directly on the sublayer of the roof underneath all the shingles. The solar mounting point is then bolted to the roof joist directly over the waterproof membrane and the solar flashing is laid over the mounting point and sealed to the underpan. The shingle is then installed over the attachment point, with a hole cut out for the attachment point to stick through. Everything is then sealed up for waterproofness. Lastly, a drain hole is cut at the bottom of the shingle, so water has a way to escape just in case it penetrates underneath the shingle. As you can see, both of these methods to install solar on metal roof shingles require installers to cut, seal, and otherwise finagle the solar attachment points, shingles, and flashings to be both structurally sound and waterproof. In comparison, attaching solar panels to vertical seam metal roofs is fairly straightforward. No matter what though, if you have a metal roof, there is always a way to install solar panels! Have you installed solar on your metal roof? Tell us about your experience in the comments below! Image Credits under CC License via Pixabay & Flickr – 2, 3.